Along with the State of the State Address, Wednesday January 10th also saw the beginning of the 2007 Legislative session. While many bills based on various other initiatives remain to be considered, several of those mentioned in the governor's speech have been heard on the floor and taken up by committee in the past week. The address began by recalling the Sago Mine disaster of a year ago and all the lessons learned by the state, including the reality that coal mine and miner safety needs to be improved. According to the Senate President's inaugural speech, West Virginia must still move forward with its energy future in a way that will also protect our unique environment while still bringing new jobs to the state. To start, the Senate has before it now Senate Bill 68 which would expand the authority of the Director of the Office of Miner's Health, Safety and Training to deal more effectively with mines in violation of safety regulations. Over the next eight weeks the Legislature will consider a budget that allows almost 45 percent of the total recommended appropriations, comprising over $1.8 billion, to be allocated to public education. This money will go toward, among other things, improving technology in the classroom as well as the general environment to see that West Virginia students are equipped with the best materials to ensure a productive learning experience. And in a more inclusive sense, there will be a marked effort starting now and proceeding into this and future sessions to make West Virginia contemporary technologically to the point of allowing it to compete not only on the national level but also with the rest of the world. To accomplish this objective, and in keeping with Speaker Thompson's charge to put people's interest over special interest, the state will be expanding its broadband Internet access in hopes of affording all residents the service by 2010. According to economic development experts, this is an important part of the state's infrastructure. This concept is evident already in Senate Bill 69, or the e-prescriptions bill, currently under consideration. This bill would allow patient prescriptions, refill orders and other pertinent information to be submitted by a physician to a pharmacy through an Internet connection. The intention is to save money in vertical integration (from health care providers down to the patients themselves) and reduce error rates so that there are no impediments upon the filling of any order. In picking up on the growing unease surrounding the employment of unauthorized workers, the Legislature has before it now a bill that would increase the penalty for these transgressions. Among its provisions, Senate Bill 70 would make it so a board or commission shall issue a cease and desist order requiring a contractor to terminate all operations at the work site where the violation occurred. To continue with the special session held in November of last year, in which the Legislature passed several bills designed to update West Virginia's tax code, several other bills have been introduced already which deal with tax modernization. Revisiting an issue that was addressed specifically during that session, House Bill 2122 seeks to eliminate the tax on foods not consumed on the premises of where they were purchased. Further, House Bill 2057 would reduce the corporate net income tax rate to eight percent and gradually lessen that rate to six percent over the next four years in an attempt to bring West Virginia up to current practices in other states. 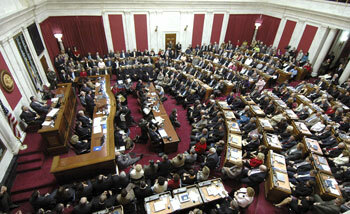 House Bill 2006 would involve income tax reduction for gifts to West Virginia charities. The purpose of this bill is to permit deductions from federal adjusted gross income, for personal income tax purposes, for contributions to religious, educational or charitable organizations. House Bill 2014 would relate to establishing the offense of setting fires in a public right-of-way or road. A criminal penalty would be given for this offense. House Bill 2026 would provide that identity theft is a felony if a person steals someone's identity with the intent to commit another crime. Any person who knowingly takes the name, birth date, social security number or other identifying information of another person, without the consent of that person, with the intent to fraudulently make financial or credit transactions in the other person's name, or with the intent to commit any crime, is guilty of a felony and would be incarcerated in a penitentiary state correctional facility for one to five years, or fined up to $1,000. House Bill 2033 would relate to false reports of child abuse. Any person who falsely reports child abuse shall be sentenced no less than 40 hours of community service. House Bill 2038 would provide for a $100 a day penalty for employers failing to withhold an employee's income for child support obligations. Upon being given notice to withhold, an employer shall withhold from employees a specified amount by the notice and pay such amount to the Bureau for Child Support Enforcement for distribution. Notice given to the employer shall contain only information relative to the amount of child support being held. House Bill 2056 would relate to the Civil Service Commission and require the State Personnel Board to consider public employees' seniority as the prevailing factor when awarding benefits or withdrawing benefits under the classified service. Also, the bill provides for current employees to receive preference for filling available positions; and eliminates the use of performance records in determining the order of layoffs. House Bill 2061 would discourage nonpayment of individual personal assessments levied for noncompliance with current mining statutes and rules by permitting assessed individuals the opportunity to either pay the penalty within the prescribed time or to complete a training class instead. House Bill 2065 would permit the head of an at-risk family to accept school loans, grants and scholarships without losing assistance while in school. "At-risk family" means a group of persons living in the same household, living below the federally designated poverty level, lacking the resources to become self-supporting and consisting of a dependent minor child or children living with a parent, stepparent or caretaker-relative. House Bill 2118 would provide for safe schools through alternative education programs for certain students. The State Superintendent shall grant county boards awards for pilot or innovative alternative education programs based on the following criteria: Programs that will serve the most students in the alternative program; programs in elementary schools that utilize in-school suspension and requirements that alternative students work their way back into the regular classroom through improved behavior; programs in middle and junior high schools and high schools that provide at least sixteen hours of instruction per week and requirements that students work their way back to the regular classroom through improved behavior; and other criteria specifically related to ensuring safety in regular classrooms and alternative education strategies to help improve student behavior and learning. House Bill 2123 would eliminate the consumer sales and service tax on food. The bill also would increase the cigarette excise tax to $1.00 per pack and increase the excise tax on non-cigarette tobacco products to 15 percent. House Bill 2167 would relate to prohibiting the use of a person's credit history in insurance transactions. House Bill 2173 would establish a system where pharmacies share information so that they may be alerted when an individual is attempting to go to multiple pharmacies with prescriptions from multiple doctors to obtain drugs for resale. House Bill 2191 would relate to exempting start-up businesses founded by West Virginia college or university graduates from various state, county and municipal taxes for the first three years of operation. House Bill 2194 would authorize issuance of warrants to extract blood analysis of persons charged with driving under the influence. Any person who drives a motor vehicle in this state is deemed to have given his or her consent by the operation of the motor vehicle to a preliminary breath analysis and a secondary chemical test of either his or her blood, breath or urine for the purposes of determining the alcoholic content of his or her blood. House Bill 2224 would increase both the minimum annual disability benefits amount for a State Police officer and the minimum annual death benefits amount for a surviving spouse of a deceased State Police officer from $6,000 dollars to $10,000 dollars. House Bill 2274 would relate to calculating child support under extended shared parenting plan. House Bill 2278 would relate to increases of salary for public employees based upon residential housing costs. Every eligible employee with three or more years of service would receive an annual salary increase equal to 4 percent of the employees' regular salary, if that employee resides in a county where residential home prices are at least 20 percent above the statewide average for residential homes. House Bill 2289 would authorize the practice of E-prescribing, by which prescription orders are electronically transmitted between such health care providers and pharmacists. "E-prescribing" means the transmission, using electronic media, of prescription or prescription-related information between a practitioner, pharmacist, pharmacy benefit manager or intermediary. E-prescribing includes, but is not limited to, two-way transmissions between the point of care and the pharmacist. E-prescribing may also be referenced by the terms "electronic prescription" or "electronic order". House Bill 2051 relates to including lasers as a method of proving the speed of vehicles. The bill would update the provisions of the West Virginia Code by adding laser technology as a method in which the speed of a motor vehicle may be proved for law-enforcement purposes. Laser devices use a time/distance calculation to measure speed. The devices aim a narrow band of light at the target vehicle and measure the time it takes to receive the reflected light. House Bill 2052 relates to providing that the term "impersonation" of a public official or employee includes the act of operating a motor vehicle which falsely displays an official emblem or other marking. The bill would make it unlawful for a person to knowingly impersonate or purport to exercise any function of a public official, employee, tribunal or official proceeding without legal authority to do so and with the intent to induce a person to submit to or rely on the fraudulent authority of the person. Senate Bill 1 would prohibit the sale of candy- or fruit-flavored cigarettes. This restriction would apply to any flavoring not associated with tobacco, with the exception of menthol. Any vendor convicted of selling such cigarettes would be guilty of a misdemeanor, which carries a $500 fine on the first offense and a $1000 to $5000 fine and/or a maximum six-month jail sentence on subsequent offenses. Senate Bill 18 would require the Public Employees Insurance Agency and Medicaid to cover testing for chronic kidney disease. This coverage would be limited to those who have diabetes, hypertension or a family history of kidney disease. Senate Bill 25 would require elected and appointed municipal officials to attend municipal meetings unless the member is ill or a quorum is not needed to conduct business. A member who fails to show up to two or more consecutive meetings that require a quorum could be compelled to show up if a majority of the other members vote to file a writ of mandamus. An absent member could also be removed from office, subject to existing state law. Senate Bill 27 would create a commission for a Drug-Free West Virginia. This commission would oversee the planning, coordinating and evaluation of local drug abuse programs. The commission would be comprised of 20 members who have an interest in eliminating the use of drug and alcohol in WV. Senate Bill 29 would give a personal income tax exemption to volunteer fire department members after meeting the requirements of a performance-based point system. The member would receive a $100 tax reduction after one year of service and, after five years of service, would be eligible for a $500 reduction. Senate Bill 33 would eliminate parole for certain parolees. Specifically, any person who has had his or her parole revoked three times would no longer be eligible for parole. The person would be forced to serve out the remainder of his or her sentence. Senate Bill 41 would provide a one-time $1200 pay increase for civilian employees of the State Police who have been employed for a minimum of three years. The raise would go into effect July 1. Senate Bill 45 would allow financial assistance to correctional officers who volunteer to move to a regional jail that is understaffed. Senate Bill 49 would require insurance companies to provide coverage for acupuncture treatments. A licensed acupuncturist must administer these treatments. Senate Bill 52 would lower the sales tax on food to 3 percent after June 30, 2007. By June 30, 2008, the food tax would be completely repealed. Senate Bill 58 would apply the consumer sales and service tax to commercial laundries and linen and garment services. Such businesses would be considered manufacturing activities for the purposes of the tax. Senate Bill 64 would expand the West Virginia Route 2 and Interstate 68 Authority to include Cabell, Mason and Jackson counties. Each of these counties, through their county commissions, would be able to appoint two voting members to the Authority. Currently, the Authority consists of two members each from Wood, Pleasants, Tyler, Wetzel, Marshall, Ohio, Brooke, Hancock, Marion and Monongalia counties. Senate Bill 70 would penalize contractors and subcontractors who employ workers without the proper state credentials. The penalty for such action would be fines, the partial revoking of contracting license or complete revoking of said contractor's license. Senate Bill 74 would establish at least a session of three days for primitive deer hunting season. During this time, hunters could buy a primitive hunting license. Primitive weapons will be determined by the Director of Natural Resources. Senate Bill 77 would allow the Attorney General to charge companies or other entities for selling gasoline, heating oil or any other motor fuels for more than 10 percent above its market price. Violators of this provision would be subject to a fine of less than $1,000, up to one year in jail or both. Senate Bill 78 would legalize and regulate the sale of fireworks in the state. The bill would require citizens to take a fireworks safety class and purchase a $20 permit to be allowed to buy and detonate explosive fireworks. Senate Bill 100 would require school employees to be reimbursed for mileage cost when they use their personal vehicle for school business. The school employees would be given the same reimbursement that state employees are given when they use their personal vehicles for work-related matters. Senate Bill 103 would prohibit drivers from using cellular phones that require to only have one hand in control of the vehicle. This provision does not include drivers using speakerphones or headsets. The driver may be given a citation, but no points will be assigned to the driver's license. Senate Bill 108 would require a defendant who was deemed financially stable to pay for jailing fees for up to 30 days. Unlike current law, a hearing would be held at or before sentencing to determine his/her ability to pay. Senate Bill 123 would prohibit drivers from driving in the passing lane of roads with a speed limit of 65 miles per hour or more, unless the driver is passing a car, turning left or is not able to safely merge into the right lane of traffic. Anyone who violates this would be subject to a maximum fine of $50. Senate President Earl Ray Tomblin and Speaker of the House of Delegates Richard Thompson look on as members of the 78th Legislature listen intently to the State of the State Address Jan. 10, 2007. Members brought their families and friends to share the occasion.